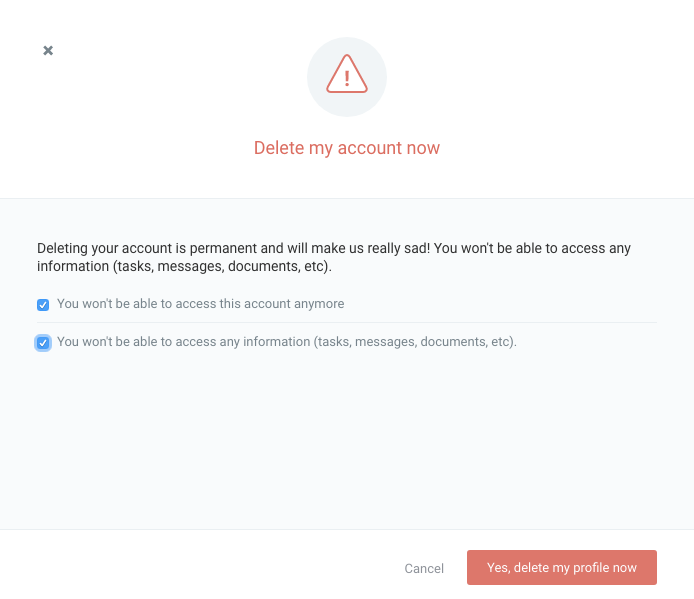 If for any reason you need to delete your user profile please follow the steps below. That's it. Once confirmed wait a moment, while the deletion process completes. You'll be logged out automatically. We really look forward to seeing you again soon in Azendoo with your team! or name another Admin and leave the workspace. N.B. If you try to leave a workspace from the Settings page, you'll get a warning message. You can delete a workspace from the Team's profile tab instead. Click on the cog icon and switch to the Team profile tab to delete the workspace team. Your session will instantly be terminated, while your account is being deleted in the background. Any question, please ask us.